How do you feel about the color green? According to at least one analysis, it ranks in the top three for women and men. Green is often associated with replenishment, energy, and life itself. It has the power to heal, to relax, and induces a positive mental state when viewed. When used at a wedding, it can be festive, soothing, or welcoming (depending on the context). If you're one of the many individuals that love green but don't quite know how to work it into your nuptials, Azazie is here to lend a hand. Today we're going to look at wedding themes that perfectly incorporate the color and provide an atmosphere where beautiful green bridesmaid dresses can thrive. The season of sun and flowers. And rain, occasionally. Provided those spring showers aren't putting a damper on your big day, its a great time for an outdoor event. People enjoy spring weddings because it's warm (but not too hot). There are plentiful options for appropriate fabrics, and nature is often looking her best. It is not uncommon to see an abundance of spring blooms, cute patterns, and light fabrics incorporated into a spring wedding. You can also bring on the pastel green dresses. Though it's not a requirement (and indeed, you're seeing some buck the trend) sage and white are a tried-and-true combination that encapsulates the essence of the spring season. If you're a fan of plant life, a vintage botanical themed wedding is the perfect setting to show your affinity for flora. Fanciful foliage will make repeated appearances during this event. Tables adorned with your favorite flowers. A vibrant bouquet and vine crown for the bride. Perhaps even some decorative air plants hanging from the ceilings. In the middle of it all, dark flower green dresses for your 'maids will round out the look. Your wedding will appear rustic, casual, and artful all at the same time. Believe it or not, a modern day fairytale wedding is well suited for the green color scheme. Fairytales go hand-in-hand with the outdoors. The "woodland chic" style provides plenty of room for experimentation. Greenery will be abundant: right down to the wedding cake, there are opportunities to work in all kinds of plant life. As for the dresses themselves, a strong emerald green will evoke an "enchanted forest" look. Your 'maids will appear majestic while retaining that humbling connection to mother nature. Don't forget to check us out for more stunning green dress ideas. 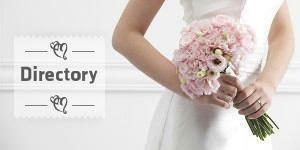 We've helped many a couple arrive at the right selection for their bridesmaids. Like Whitney and Anthony. 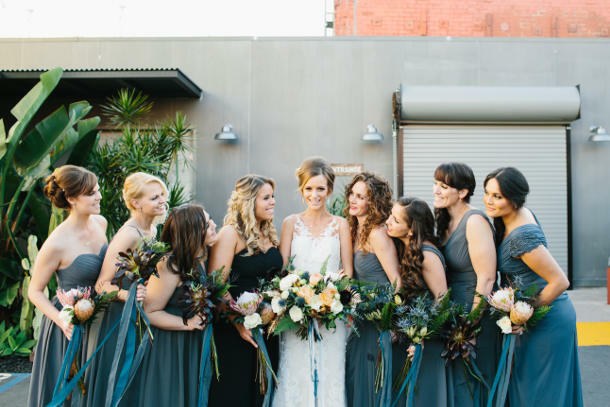 Dark green dresses were the perfect fit for their winter holiday-style wedding. This allowed the couple to convey the Christmas spirit without beating the point into the ground. It also went well with the fantasy elements that they both enjoyed so much. Expect the color green to remain a versatile favorite for those who know how to weave it into the theme of a wedding right. Azazie is a unique platform that matches wedding party needs to the skilled craftsmanship of a small group of artisan tailors. All their dresses are custom-sized and made to order. At Azazie, they avoid traditional retail costs of advertising, physical retail space, procurement, and unsold inventory. Every dollar spent on the site goes directly into the design, materials, and craftsmanship of the dress ordered.